In the early years of light alloy wheels it was the mass manufacturers that offered alloy wheels as an upgrade on their products. If you knew which manufacturer the pattern belonged to you knew the PCD. But as more and more aftermarket wheel manufacturers and suppliers evolved, the same wheel pattern could now be offered with many different PCD options. This is where a small easy to use PCD measuring tool comes into the equation. It is both small and light enough to carry around and will not bend or break the first time its dropped. Car Owners, Classic Car Restorers, Custom & Modified Car Builders, Trailer & Caravan Owners any anybody else that has a need to buy light alloy or steel wheels. Today as an aspirational purchase many wheel shops like to have a number of wheels on the shop floor for the customers to get close too. 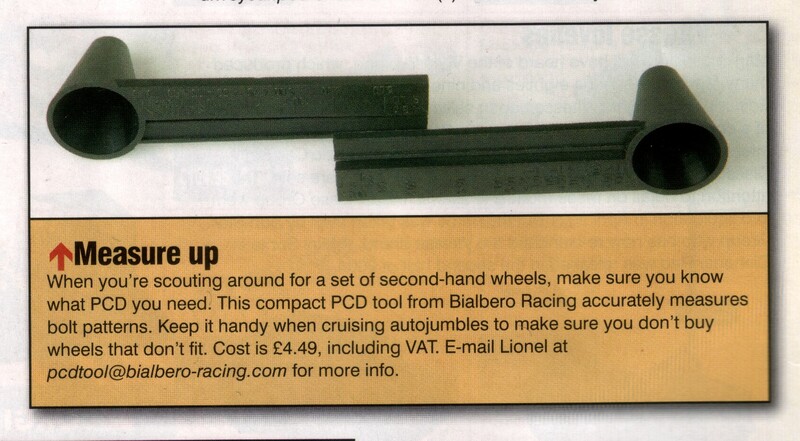 Retail potential: By selling the tool to customers they are able to buy wheels for that kit or other project car they might be building even if they don't know the origin of the axles used on the kit. Staff potential: Displays look better if they are not constrained by having the original box packaging on show with the wheels, this leaves the problem of matching the wheels to their packaging. Unlike most existing PCD tool designs this is not based on a vernier type scale; it is contained within the PCD itself. 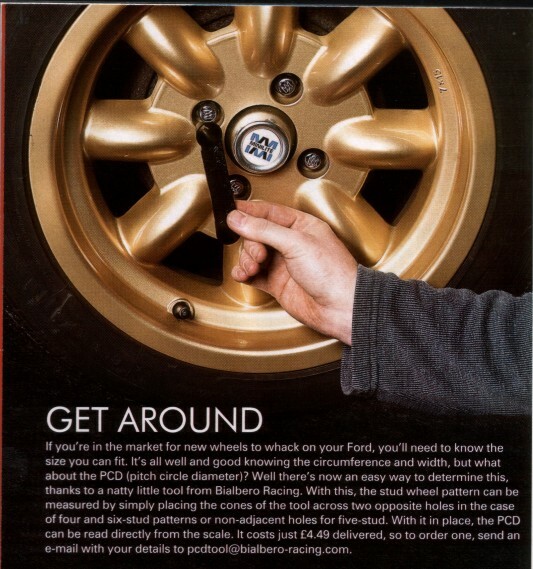 Because the scale is within the PCD it will measure rims as small as 5" 127mm inside rim, making the tool useful for finding trailer wheels as well as any full size car & caravan wheels. The scale is moulded into the plastic so there is no chance of it slipping as the adhesive ages. By designing the ends as cones it is able to find the centre of the bolt hole without a problem, and it is also able to find a PCD from the studs protruding from early type axles by using the hollow of the cone. It is then possible to read the PCD directly from the measuring tool by looking at the appropriate scale and reading across to the arrow. It is also possible to measure axle studs by placing the hollow of the cone over the studs ( some disc brake set-ups may prevent this). 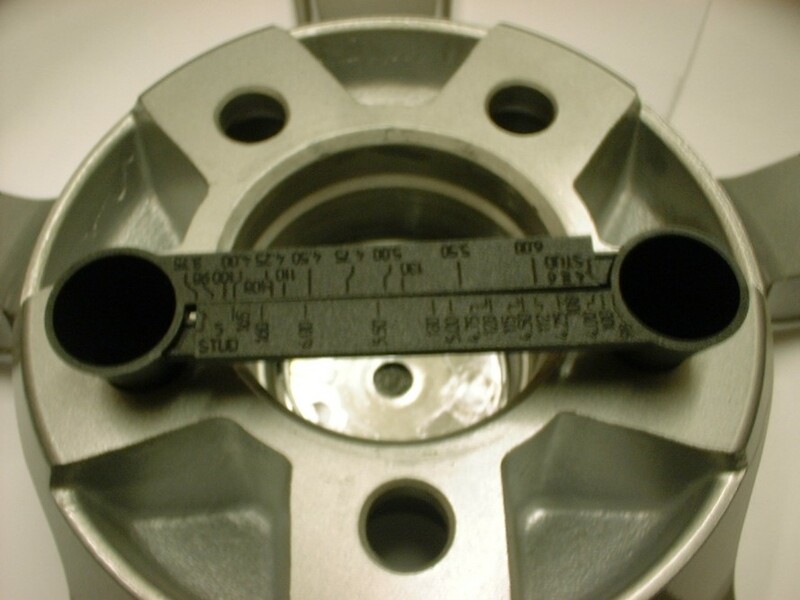 On uni-lug or slotted lug wheels you will need to measure both the smallest and largest PCD to determine if the size you require is covered, these may require the use of special washers. Retail Trade prices available on all orders of 5 or over, Please ask for details stating quantity required. End user Trade sales available, Please ask for details stating quantity required. All Postage is Via Royal Mail Standard 1st Payment: Payment accepted by PayPal to "lionel@bialbero-racing.com"
Items are Posted on Thursday of each week. Bialbero. Italian for Two Trees the closest they have to Twin cam. Lionel Body (Owner). A self-confessed car nut with a liking for all things automotive. I have owned all manor of cars from minors to yanks, kits to classics, vans, integrales , rods & hot hatchbacks. I also hate throwing car mag's away so I now have a library dating back to the late 60's.